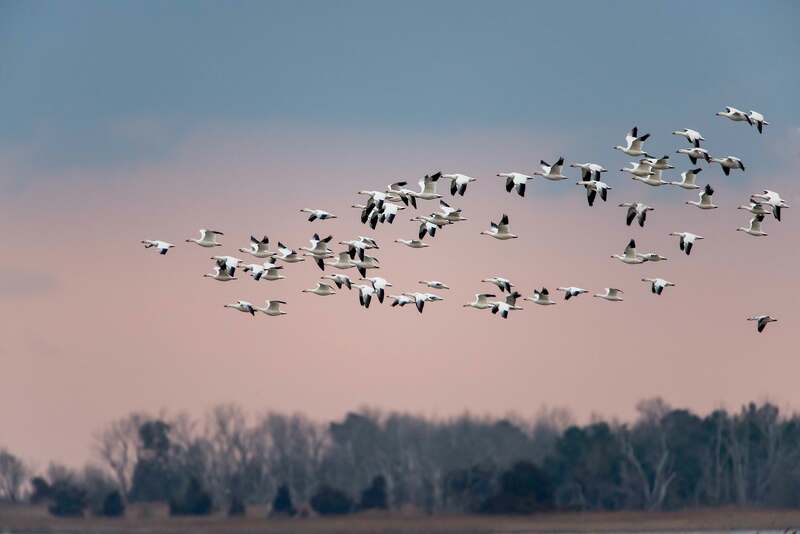 Having received reliable reports of significant numbers of Snow Geese in the marshes and wetlands along the Delaware Bay, I went to Bombay Hook National Wildlife Refuge (NWR) and Prime Hook NWR. I went with two friends, who also are passionate, experienced photographers that enjoy being outdoors even on very cold, windy mornings, which is how it was two weeks ago. 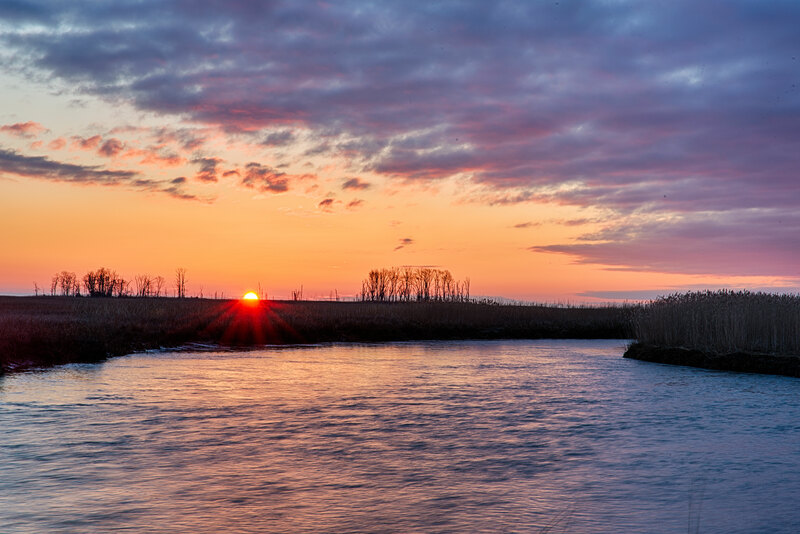 We left Friday afternoon around 3:00 and arrived at Bombay Hook NWR just before sunset, which was early enough for us to scope out the area for wildlife (in particular, Snow Geese) and look for the best location to shoot the sunrise the next morning. Sunset was pretty, but not special (above image). I have seen some awesome sunsets from the same location on other visits (two examples below from last year). Although we saw a lot of Snow Geese in farm fields near the refuge, there were none in Bombay Hook’s tidal pools and marshes. However, we did see some small groups of geese flying nearby; therefore, we hoped more would arrive later and spend the night at the refuge. On Saturday morning, we started out early, leaving the hotel at 0450. 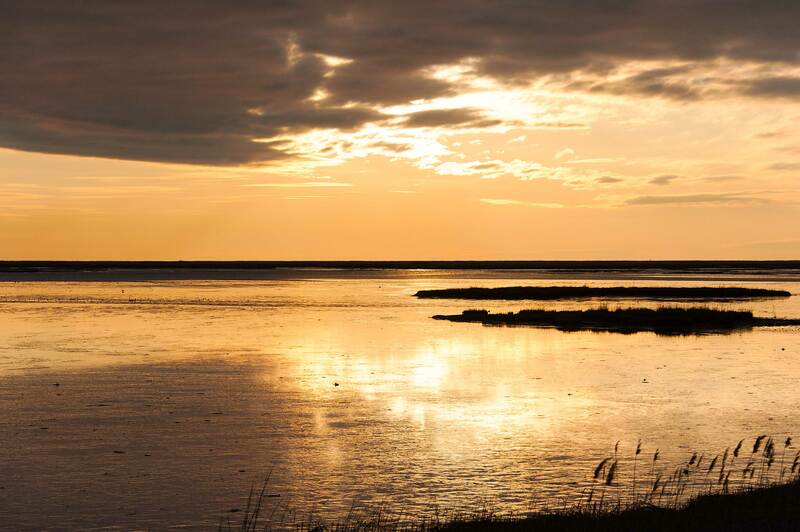 We arrived at the refuge before sunrise, at twilight, when the sun’s light was illuminating the horizon. 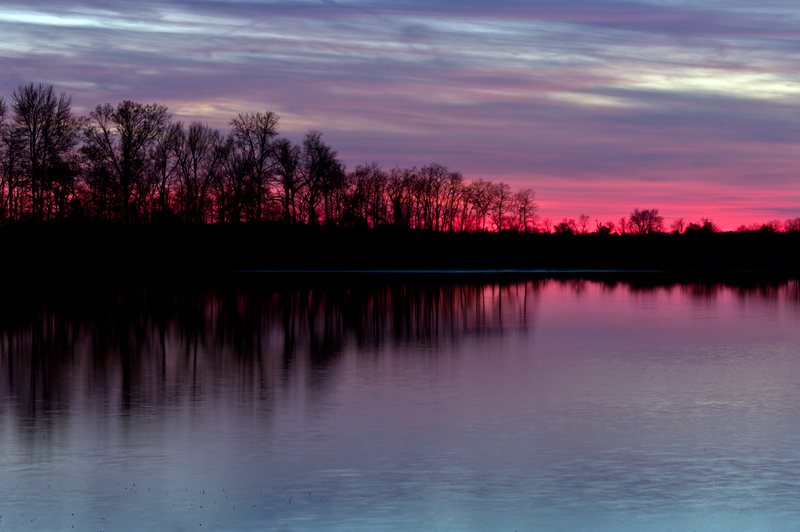 The colors were spectacular, and the horizon was glowing in brilliant shades of orange and yellow. It turned out to be a beautiful sunrise, cold, but we had the refuge to ourselves, making it even better. After photographing the sunrise, we worked our way around the refuge’s nature drive looking for wildlife and attractive, sunlit landscapes. We did not find a lot of wildlife. There were a few Tundra Swans, some Canada Geese and Shoveler Ducks, a few Pintails and Bufflehead Ducks, plenty of Coots, and an occasional Great Blue Heron. 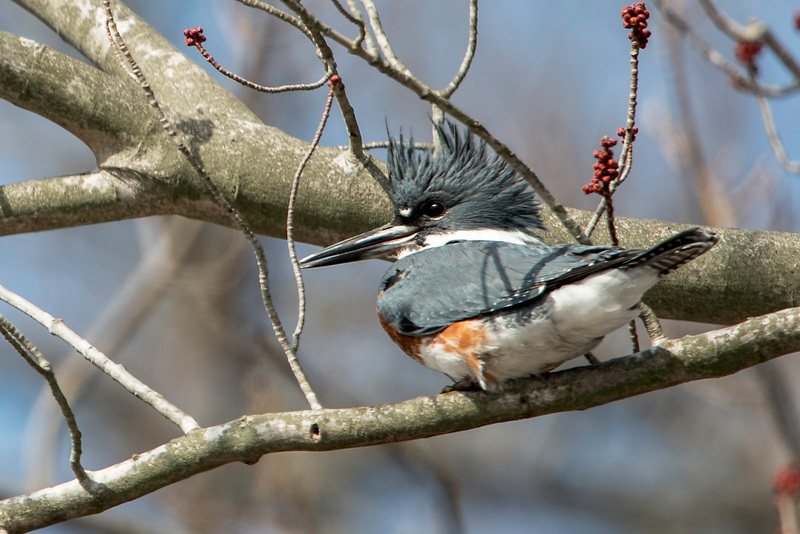 Before heading south to Prime Hook, we stopped to photograph a female Belted Kingfisher. 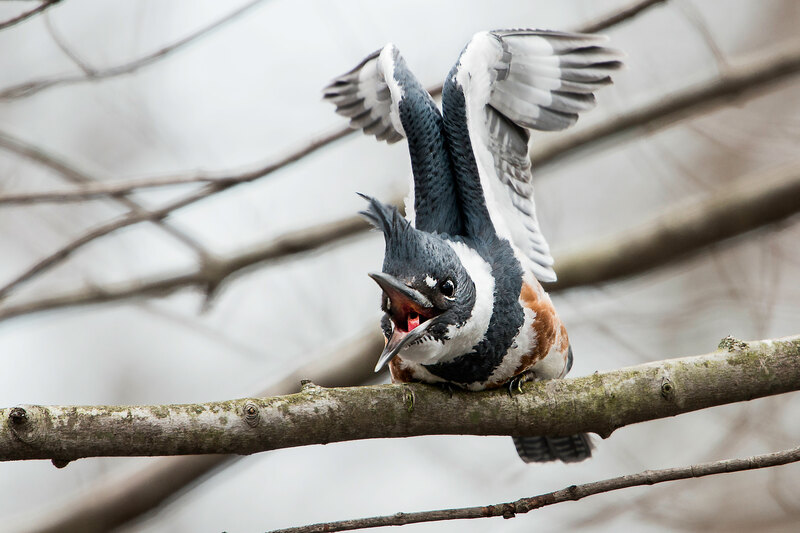 Kingfishers are typically very active, fast, and entertaining. 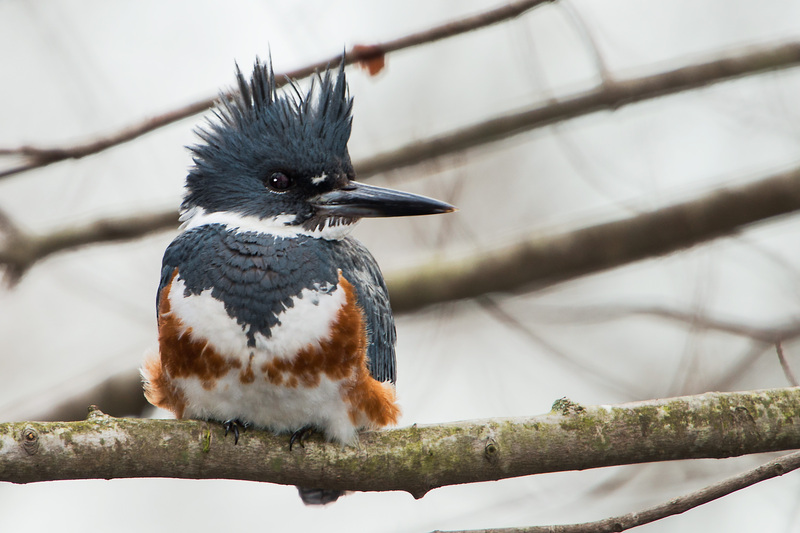 This kingfisher moved within a nearby tree hanging over a creek, staying in sight for over 30 minutes, while we filled our memory cards with her images. It was as though she was posing for us. This does not happen often. The below image of the kingfisher with her beak wide open was the final shot of a series of images when she was stretching and yawning. We must have been boring her. 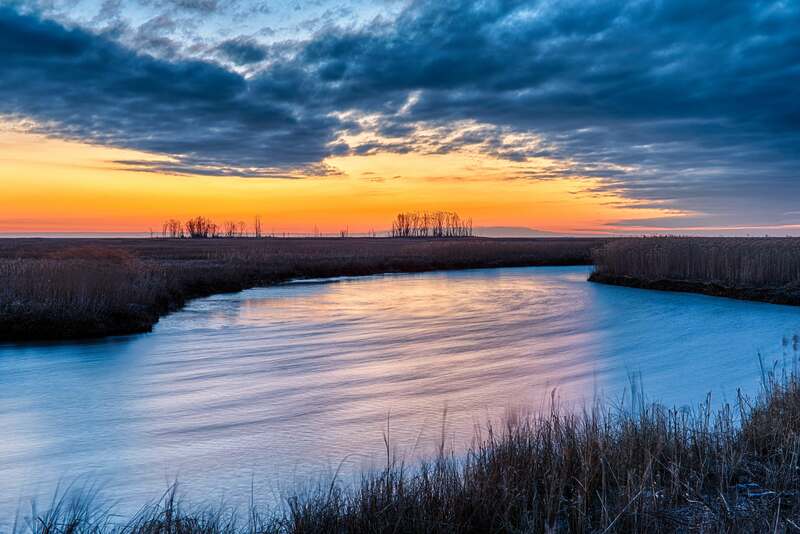 It was late afternoon when we arrived at Prime Hook NWR. Again, we hoped to find a lot of Snow Geese, or at a minimum, Snow Geese heading to the refuge for the evening, but they were not around. While there, we met a local resident whose home is on the beach; there is a small strip of land and beach within the refuge with bay front homes. 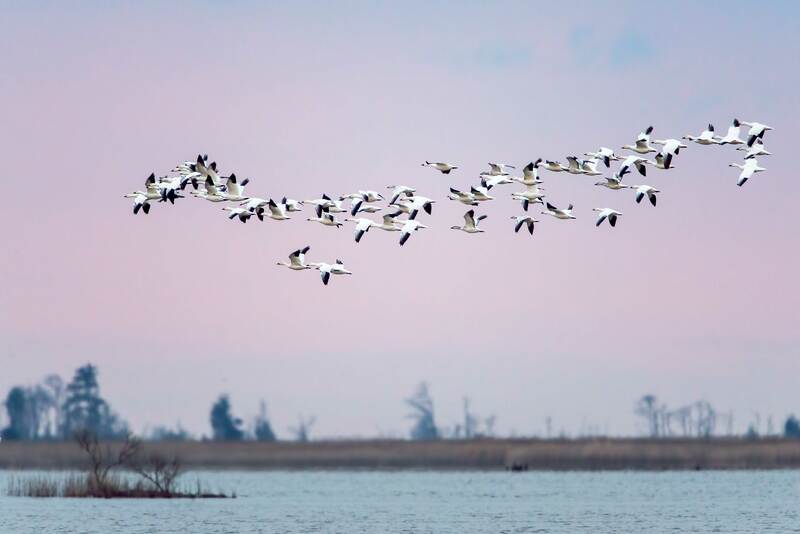 He said he had been seen thousands of Snow Geese, about 4 out of 7 days a week. Unfortunately, it looked like it was going to be one of those days when the geese did not return. Nevertheless, we agreed to return at sunrise with hopes of finding them there. It was the same location where I had seen and photographed over 200,000 geese last year. Therefore, we were hopeful. Sunday morning was another early day. Starting out from the hotel at 0500, we arrived at Prime Hook before sunrise and could hear Snow Geese, but could not tell how many. As the sun rose and it got brighter, we could see that there were at least 20,000 geese. My excitement rose as we prepared to photograph them. It was very cold, but I was not thinking about the weather; rather, I was thinking about where to be best located to photograph the Snow Geese while they were on the water, as well as when they took off. I left my friends and headed back up a dirt road that paralleled the water until I was as close as I could get to see and photograph the geese. After arriving at the better location and setting up my camera (Nikon D800 with 600mm lens), it was not too long before the Snow Geese became louder and very restless. Many small groups were beginning to take flight, leaving behind the majority of the geese. However, it was not long before all the remaining Snow Geese, at least 15,000, took flight and blasted out of the water almost in unison. It was exciting to see and hear. One minute, it was very noisy with the loud constant squawking of the geese, but then they were quickly gone, and it was dead silent. We left too, but it was too early to head home. 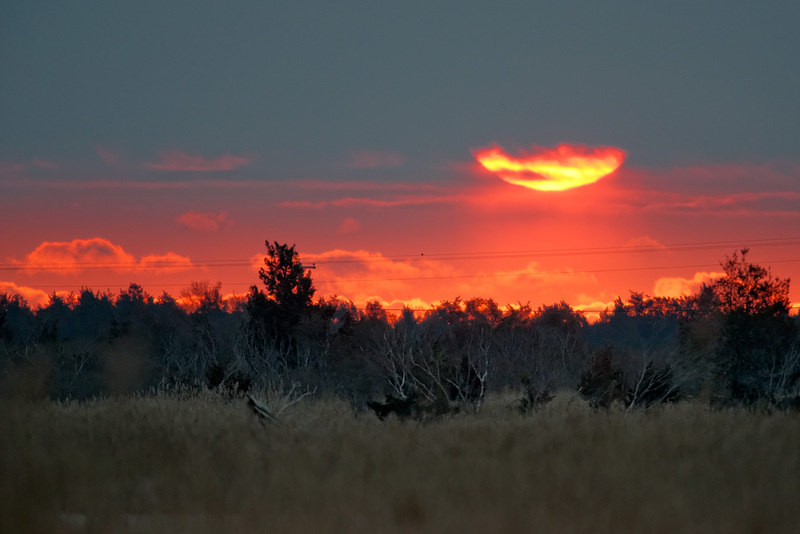 Since it was early, we decided to head to Blackwater NWR to see if there was anything happening there. About two hours later, we arrived and drove through the refuge. It was very quiet, more people than critters, and less activity than I have ever experienced at Blackwater. It was cold and windy— everything must have been huddling out of the wind. It would have been very disappointing, but I was still excited from seeing the Snow Geese blast off just a few hours earlier. 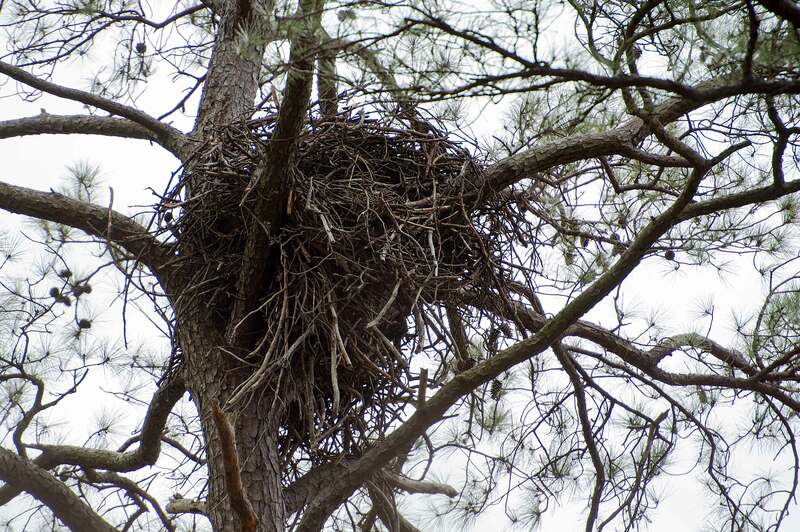 Shortly after entering Blackwater NWR, we stopped and entered a wooded area to locate an eagle’s nest (below image) to see if there was any visible activity, but there was none to be seen. However, I heard from a reliable source that there was an eagle sitting on eggs in that nest. She was probably there, but down low in the nest out of the wind. It was a fabulous weekend with friends, photography, and some of Nature’s spectacular beauty. 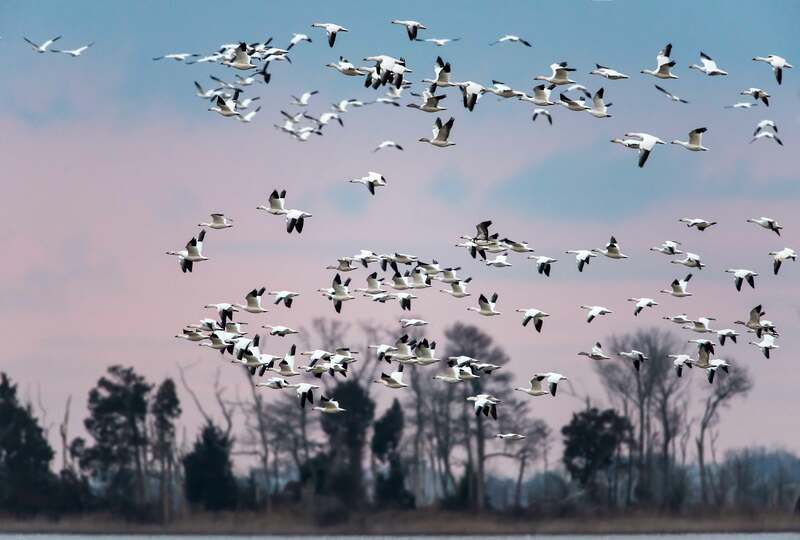 This entry was posted in National and State Parks, Nature, sunrise, Sunset, Wildlife and tagged bombay hook national wildlife refuge, nature, Prime Hook National Wildlife Refuge, Snow Geese. Bookmark the permalink. Beautiful sky images … again! And love the video, great way to share the “blast off” experience with us armed chair travelers. Another great post! Reading the story and seeing the photos made me feel like I was right there with you. The Sunday morning sunrise is really interesting – almost an unearthly feeling. I like it more each time I see it. I assume that it was shot with the 600 in order to get the sun so large in the frame. Gorgeous! Great colors from the sky and I love Kingfishers. “Love This” Steve! Especially the colors of the environmental s………. Very Nice! I almost missed this! What I did not include Jim was the drive on Kraft Neck Road, because we only saw a Red-shouldered Hawk and adult eagle, which were too far away for any decent photos. Nevertheless, I enjoyed the ride and views from the SUV.